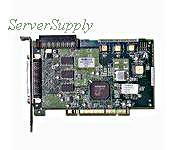 IBM - 01K7364 IBM - SERVERRAID 3L ULTRA2 SCSI RAID CONTROLLER CARD (01K7364). NEW BULK. IN STOCK. SHIP SAME DAY. IBM - 01K7352 IBM - SERVERRAID 3L ULTRA2 SCSI RAID CONTROLLER CARD (01K7352). NEW BULK. IN STOCK. SHIP SAME DAY. IBM - 19K0564 IBM - SERVERRAID 3L ULTRA2 SCSI RAID CONTROLLER CARD (19K0564). NEW BULK. IN STOCK. SHIP SAME DAY. IBM - 37L6083 IBM - SERVERRAID 3L ULTRA2 SCSI RAID CONTROLLER CARD (37L6083). NEW BULK. IN STOCK. SHIP SAME DAY. IBM - 33L5000 IBM - PCI WIDE ULTRA 2 SCSI CONTROLLER CARD (33L5000). CLEAN TESTED. IN STOCK. SHIP SAME DAY. 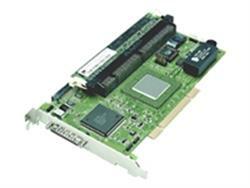 Adaptec - AHA-2940U2W ADAPTEC - 32BIT PCI ULTRA2 WIDE SCSI CONTROLLER CARD (AHA-2940U2W). NEW BULK. IN STOCK. SHIP SAME DAY. Adaptec - AHA2940U2B ADAPTEC - 2940 50PIN PCI ULTRA2 WIDE LOW VOLTAGE DIFFERENTIAL SE SCSI HOST BUS ADAPTER (AHA2940U2B). NEW BULK. IN STOCK. SHIP SAME DAY. 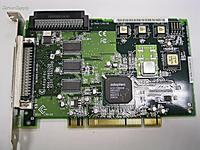 Adaptec - AHA-2940U2B ADAPTEC - 68PIN PCI ULTRA2 WIDE SCSI INTERNAL LVD/SE CONTROLLER CARD (AHA-2940U2B). NEW BULK. IN STOCK. SHIP SAME DAY. 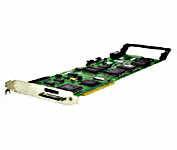 Adaptec - ADAPTEC PCI-TO-ULTRA2 SCSI RAID ARRAY CONTROLLER PN: AAC-364 P/N: 1871500. 64-bit PCI-to-Ultra2 SCSI RAID Array Controller. Adaptec - FACTORY BOXED ADAPTEC AHA-3950U2 ULTRA2 KIT LVD SCSI CONTROLLER CARD WITH DRIVER & BOOKS PN: 1796700 ADAPTEC AHA-3950U2 DUAL ULTRA2 LVD (32 OR 64BIT) PCI UP TO 266MBYTE/SEC UP TO 30 SCSI DEVICES. 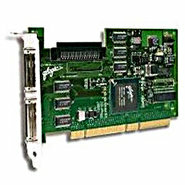 Qlogic - QLA1280 QLOGIC - DUAL CHANNEL 64BIT PCI ULTRA2 SCSI HOST BUS ADAPTER (QLA1280). CLEAN TESTED. IN STOCK. SHIP SAME DAY. Adaptec - AAA-131U2 ADAPTEC - SINGLE CHANNEL ULTRA 2 SCSI RAID CONTROLLER CARD (AAA-131U2). REFURBISHED. IN STOCK. SHIP SAME DAY. Dell - 31UFC DELL - PERC2 QUAD CHANNEL 64BIT PCI ULTRA2 LVD SCSI RAID CONTROLLER CARD WITH 128MB CACHE (31UFC).CLEAN TESTED. SHIP SAME DAY.